Liquor pourers, medium flow executive liquor dispenser pourers. 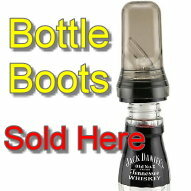 Bottle top whiskey pourers-12 per pk. 1 doz. Chrome plated "370" Series Liquor Pourers. 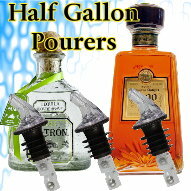 Our liquor pourer bottle dispensers are the best quality liquor pourers. 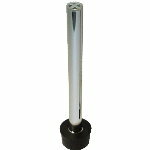 These 370 series dispensers are a very low cost and effective pourer. 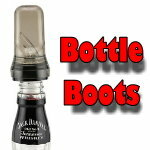 1) Keep your pourers clean to insure they continue to work properly. Heavy sugar liquors will build residue and hinder the mechanics of these pourers if not cleaned weekly. 2) Soaking your pourers in soda water overnight will remove only a portion of build-up in the pourers. Pora-Clean's pressurized cleaning system cleans pourers quickly and thoroughly. Under normal use, alcohol and liqueurs evaporate in the pourer leaving a sugar residue behind. This may cause ball bearing liquor pourers to stick and plug up the breather hole. Regular cleaning will keep your pours flowing freely and and measure correctly. Soaking pourers is labor intensive and doesn't clean them thoroughly. The Poura-Clean allows you to clean dozens of pourers quickly and easily with additional trays available. Clean all types of pourers in three easy steps. Fill tray with pourers and attach to bar, then fill base to fill line with warm water. Place tray in base and pump handle. The water gets pushed through the pourers cleaning all sugar residue out.